Jesse James And Kat Von D Are Engaged. Yes, Really. I don’t know why this bothers me so much, but it does. 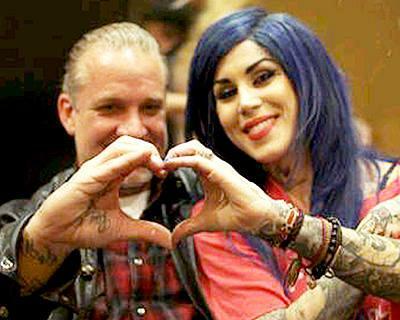 Super-Tat couple Jesse James and Kat Von D are getting married. I realize they’re probably a better fit than Jesse and Sandra Bullock were, but it still rubs me the wrong way. Maybe it’s because they’ve only been together for a little over six months (if you visit my site enough, you’ll know I take issue with marriage after a year or less of dating), or maybe it’s because in the months following the breakup of his marriage to Sandra Bullock, Jesse James came off as a smug a-hole who seemingly didn’t care about all the pain he caused. And apparently he still doesn’t mind coming off as a complete douche, because he basically sainted Kat Von D to the press while at the same time jabbed Sandra Bullock in the side. Um, hello Jesse! You were the jerk, not Sandra; there’s no reason for you to rub salt in her wounds. I give it less than two years. Does Kat Von D really think Jesse James can be faithful? Is she in denial, or just stupid? …“There is no one else for me. He’s the one,” The LA Ink star tells PEOPLE. Barf. I guess everyone deserves to be happy, but still…..BARF. previous post: Camille Grammer Says She Was Joking. Um…Duh? next post: Joan Rivers Wants FOX News To Go F*uck Themselves. And I Agree. Well other couples have gotten married after a couple of weeks. Like Tommy Lee and Pamela, but I guess they are just made for each other. What bothers me is that she didn’t want to commit to Nikki Sixx, but now she is all for it. Oh wow he went and found someone that classes it up his style…Also he had to go and get someone that is famous cause he is a has been and doesn’t want to be forgotten…Have you seen his face??? My 78 year old grandfather has less wrinkles than he does. I can’t believe that they don’t put a limit on the amount of times that you can get married…Jesse…give up your not marriage material!!! 53 queries in 1.252 seconds.